People use virtual assistants such as Amazon Echo for simple tasks and mostly connect them to a smartphone rather than to other connected devices. WASHINGTON, D.C., February 12, 2019 – Slightly more than one-fourth of people (27%) own an AI-powered virtual assistant such as an Amazon Echo or Google Home, according to new research from Clutch, the leading B2B ratings and reviews site. 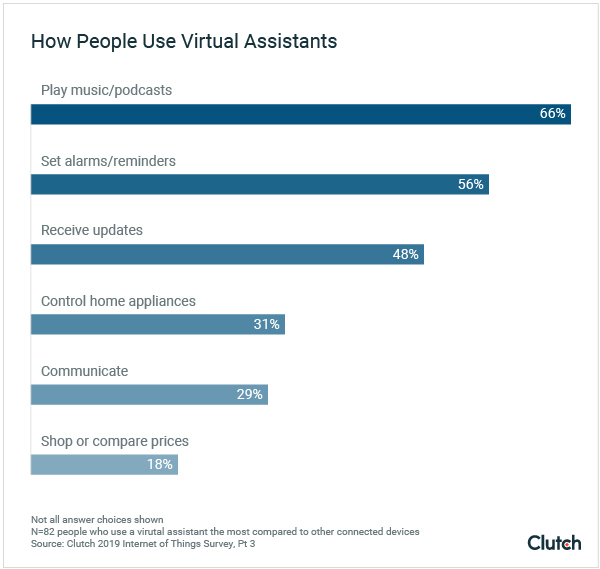 People use virtual assistants for simple tasks and commands, mostly playing music or podcasts (66%), setting alarms or reminders (56%), and receiving updates about news, weather, or sports (48%). These primary uses for virtual assistants indicate that people are comfortable using voice commands to accomplish simple tasks. The biggest benefit nearly half of people (44%) experience from owning and using a virtual assistant is easy access to information such as health data, notifications, and updates. The tasks people use virtual assistants to accomplish influence the benefits and challenges they experience when using AI-powered devices. Because most people claim virtual assistants are helpful for simple tasks, more than two-thirds (35%) claim they do not experience challenges with their virtual assistants. Connectivity is the most common challenge people experience (20%). As people use virtual assistants and AI-powered devices for more complex tasks, the challenges they encounter will likely become more complex. As virtual assistants enter more homes, more people will use voice commands to access information. When people issue voice commands, they expect their virtual assistants to understand context. “The biggest challenge is people would expect this kind of device assistant to understand natural language and the context,” said Max Gladysh, co-founder of BotsCrew, an AI development company in Lviv, Ukraine. As a result, companies need to optimize their website content for user intent: Create content that responds directly to the information people search for online. Amazon is the most popular brand of virtual assistant. Two-thirds of people (66%) of people with a virtual assistant own an Amazon Echo, ahead of 40% who own a Google Home. Google and Apple are catching up with Amazon, though. Google, for example, has its assistant embedded in over a billion devices. Only 6% of people connect their virtual assistants to other connected devices, compared to over three-fourths (77%) who connect their virtual assistants to smartphones. This trend is shifting, however. The easier it is to connect virtual assistants to other devices, the more people will experiment with advanced uses such as controlling home appliances. Apple HomeKit, for example, now allows people to connect devices simply by scanning a barcode. Clutch’s survey included 503 people who own a connected device. For questions about the survey, a comment on the findings, or an introduction to the industry experts included in the report, contact Grayson Kemper at [email protected]. A B2B research, ratings, and reviews firm in the heart of Washington, DC, Clutch connects small and medium businesses with the best-fit agencies, software, or consultants they need to tackle business challenges with confidence. Clutch’s methodology compares business service providers and software in a specific market based on verified client reviews, services offered, work quality, and market presence.